This week, a concept mission for a Pluto lander was presented by Global Aerospace Corporation (GAC) at the NASA Innovative Advanced Concepts (NIAC) Symposium in Denver, CO. As currently envisioned, the probe would land on Pluto using drag from the super-thin atmosphere and a few pounds of propellant. 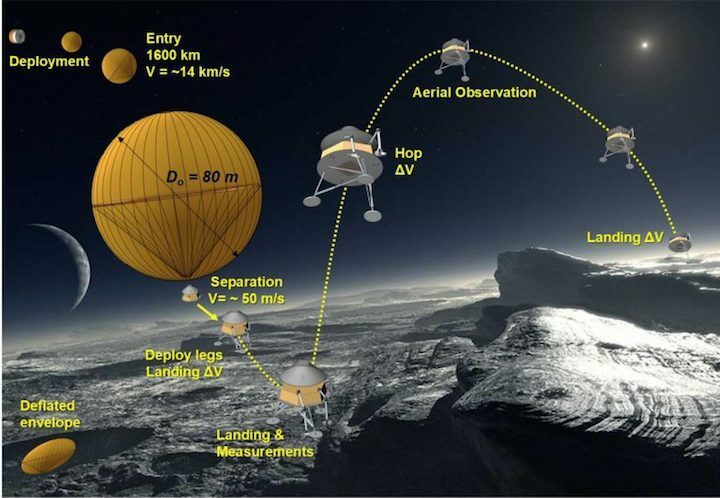 Then, it could explore the surface further by “hopping” from one location to another, using Pluto’s low gravity. The probe would be capable of traveling tens or even hundreds of kilometers at a time and features of interest could be studied up close at many different locations. The “entrycraft” as it is called would need to be almost the size of a football field in order to bring the lander to the surface. According to GAC, the mission could be launched as soon as 12 years from now.